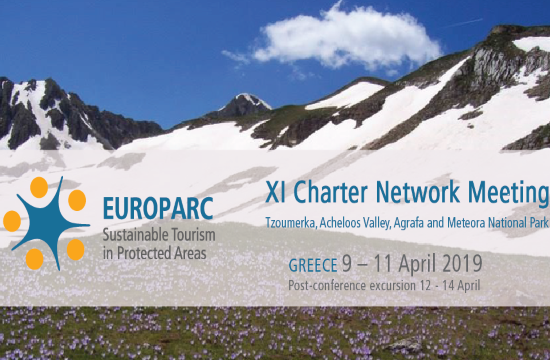 The Management Authority of the National Park of Tzoumerka, Acheloos Valley, Agrafa and Meteora, organizes the 11th European Charter Network Meeting on April 9-11, 2019 in Pramanta of the Municipality of Northern Tzoumerka on “The Social and Cultural Implications of Tourism: Looking for a Sustainable Answer “, int.ert.gr reports. The National Park of Tzoumerka, Acheloos Valley, Agrafa and Meteora, is the first Greek protected area, which was certified in 2016 by the European Federation of Protected Areas (Europarc), as a viable destination. The EUROPARC Federation, based in Regensburg, Germany, is the network for Europe’s natural and cultural heritage. Established by its members, the Federation works to improve the management of Protected Areas in Europe through international cooperation, exchange of ideas and experience, and by influencing policy. The Federation had currently over 380 members in 37 countries, many of which, represent thousands of protected areas. A series of parallel sessions will take place during the meeting, by experts as well as a full program of workshops and excursions that will enable the participants to deepen their knowledge on related topics and exchange experiences. This meeting is of great significance, since it is the first time that the Pan-European Federation of Protected Areas – Europarc takes place in Greece. The Managing Authority looks forward to a successful meeting, which is expected to attract over 100 foreign delegates who will also have the opportunity to enjoy Epirus’ unique landscape and nature.